Although fiscal years differ by library, one constant theme is that reports become even more important as these periods are winding up. We here at UMS strive to make sure clients have all the information they need for reporting purposes at all times. Below are actual questions and comments from libraries regarding reports and their answers to help make sure you are getting the most out of UMS’ Monthly Management Reports. c. Change of Address (COA) Report: A detailed listing of new addresses and phone numbers obtained the previous month. 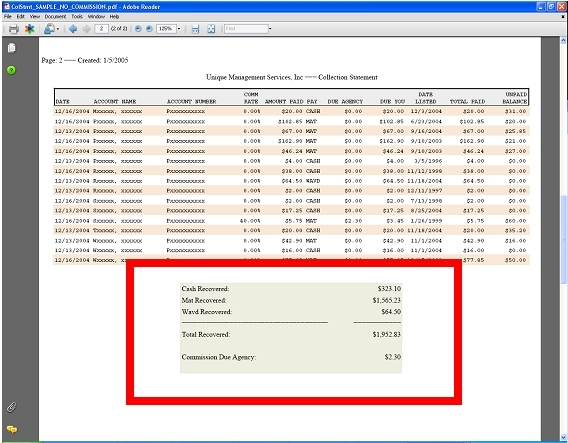 d. Summary Status of Accounts Report: Accompanying the invoice; Historical summary of collection efforts. e. Suspended Accounts Report: List of all accounts suspended by the library. f. Bankruptcy Report: List of all accounts with pending or granted bankruptcies. In an effort to be environmentally conscious and keep costs low, UMS does not provide these reports in paper form as a normal course of action. However, if the library would prefer paper reports, please contact your Customer Service Specialist to arrange this. There is a very helpful “Monthly Report Terminology” explanation page available on the ‘Help’ tab of InfoLink. This document explains all the reports and their headings in detail so the library can have an easy to use reference guide. Further assistance is always available by contacting your Customer Service Specialist. This was a common request from the survey and while not provided on the Summary Status of Accounts, monthly numbers actually are available on the Collection Statement. This report outlines payments made by patrons during the individual month as well listing as a cumulative total for the month at the end of the report as seen below. We get so many requests for individualized reports, that it would be nearly impossible and impractical to make every request available to all of our libraries. Some reports, such as generating a list of patrons submitted in a certain timeframe, can be obtained by using the Account Access feature on InfoLink and exporting the information to Excel. Special reports, and answers on the best way to obtain those, are always available by contacting your Customer Service Specialist. This is a comment that helps illustrate the last point — We are always working to make our reports better and more useful for our libraries! We appreciate your input and are always trying to make sure the reports evolve so the needs of our clients are being met. If you have any questions, ideas, or would like to request a report, please feel free to contact us at your convenience.